It will be a day of increasing avalanche danger, with natural avalanches possible this afternoon and tonight during heavy snowfall and period of strongest winds. The avalanche danger is CONSIDERABLE on and below steep, wind drifted slopes at mid and upper elevations. Human triggered avalanches are likely and natural avalanches may become possible. Avoid being on or beneath the heavily corniced ridgelines and in avalanche runout zones such as gullies and couloirs being loaded by the wind or heavy snow. Seek out non wind-drifted terrain . Wind sheltered, mid elevation terrain has a MODERATE danger, and much better turning conditions. Sadly, there was another avalanche fatality yesterday in the western Uintas. A 49 year old man triggered a deep, wide avalanche and was buried and killed. Very preliminary report here. Thursday, a snowmobiler was killed in an avalanche near Circleville Mountain in the Tushar mountains. Our deepest condolences to both their family and friends. There have now been four avalanche fatalities in four weeks in Utah. Snow + wind = avalanches. With several more storms on the way, the avalanche danger will remain elevated in all the mountains of Utah through the week. Overnight, the mountains received 3 to 6” of very low density snow (5%), with upper Big Cottonwood, favored by the southwest flow, coming in at 12” of snow. Temperatures are in the teens this morning, scattered light snow showers continue, and there has been a bit of a lull in the southwesterly winds. Speeds are moderate - averaging 10 to 15 mph at most stations, with only a couple ridgeline stations averaging 25 to 30 mph, gusting in the 40s. There will be a few golden hours this morning before the southwesterly winds once again increase ahead of the next cold front. Increasing snow and wind by around noon, with the cold front arriving between 4 - 6 pm, accompanied by lightning and a burst of heavy snow. The strongest winds will be from about noon to 8 pm. Average speeds on mid elevations ridgeline speeds could reach 30 mph, with gusts in the 40s. The high elevation alpine terrain could average to 40 mph, gusting in the 60s. Winds will shift to NW and decrease after the front, with snow through midnight for areas favored by northwest flow. Snow totals of a foot or more by morning, with temperatures falling into the single digits. A large slide, probably cornice triggered, ran down Tanners yesterday while there were parties in the gully, but no one was caught. Other reports were of widespread, stubborn, hard wind slabs, with people avoiding the wind drifts on steep slopes in the backcountry. Photo - LARGE, deep, explosive triggered slide from Friday in Little Cottonwood Canyon. Wind drifts continue to be the number one avalanche concern today. The low density, overnight snow will be the weak layer for the next round of wind drifts. As the winds pick up today, new wind drifts will become deeper, more widespread and more sensitive. The old, hard wind drifts are now hidden beneath the new snow, and are more stubborn, likely to break above you or on the second or third person. It is possible to trigger these drifts from a distance or from below. The wind drifts will become more widespread as the day goes on, and natural releases are possible this afternoon. Cornices continue to grow and will break back much further than expected. Travel way back from the edges of ridgelines and avoid travel beneath them. Out of the wind drifted terrain, the new snow could sluff or produce shallow soft slabs during periods of heavy snowfall at all elevations. 1. Weak surface snow and patches of surface hoar were buried Saturday night are slowly strengthening. However, avalanches could still be triggered on this layer, and would be 2-4' deep, most likely on wind drifted north to easterly facing slopes, with elevations from 8500' to 10,500'. In snowpits, look for the 'thin grey line' a couple feet down in the snowpack (pic below). Slides failing on faceted weak layers can be triggered from a distance, including from below. Andy Paradis photo, Park City ridge line. This was on a west facing slope. 2. More snow and wind this afternoon will continue to load the deep weak layers in the snowpack, layers which continue to produce isolated avalanches down near the ground 3-6' deep. 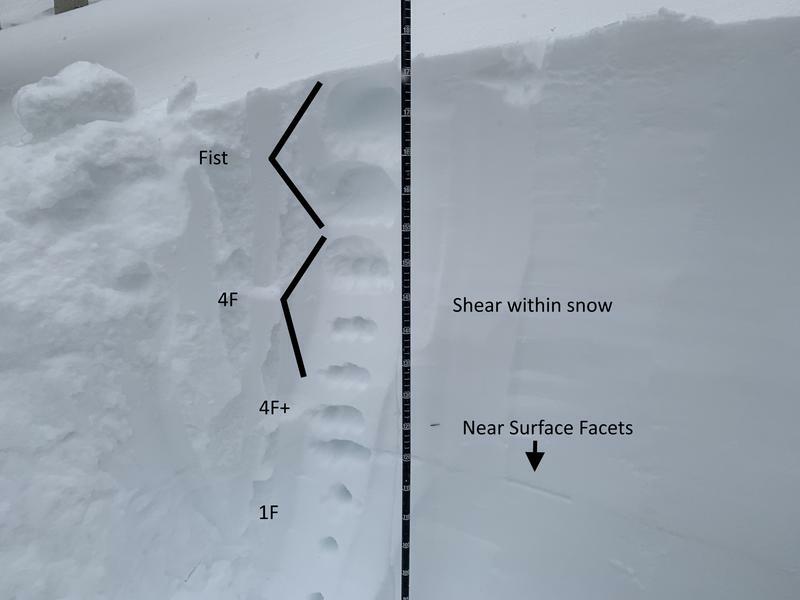 While more likely to occur on slopes that have avalanched previously, two of Friday’s explosive triggered slides were on slopes that had not slid this winter. These deep slides may require more of a significant trigger, perhaps a wind slab stepping down or cornice fall. Odd areas with traditionally shallow snowpacks such as Lambs, parts of Mill Creek, No Name or Snake Creek are more suspect.